The St. Regis Punta Mita Resort, Four Seasons Resort Punta Mita, in conjunction with DINE, the developer of Punta Mita Resort, and Riviera Nayarit Convention and Visitors Bureau have announced the third annual Punta Mita Gourmet & Golf Classic to be held from April 11-14, 2013. This unprecedented four-day event marries the sophisticated worlds of culinary excellence and championship golf on one of the most beautiful and attractive destinations in the world: Punta Mita, located at the northern tip of Banderas Bay in Riviera Nayarit. In previous years, more than 200 visitors from around the world took part in this celebration and immersed themselves in the culture, sport and splendor of the destination. In celebration of this event, The St. Regis Punta Mita Resort, Four Seasons Resort Punta Mita, Punta Mita Resort and Riviera Nayarit invite you to enjoy the pre-sale prices available until February 28, 2013, and representing a savings of 10 percent. "We are honored to bring the Punta Mita Gourmet & Golf Classic into its third year," said Carl Emberson, general manager of The St. Regis Punta Mita Resort. "This event brings together some of the leading names in the industry and shines light on Punta Mita’s collection of treasures including its stunning natural beauty, its array of private homes, two world class resorts, acclaimed Jack Nicklaus golf courses set along the coast, and talented chefs, winemakers and tequila masters, from Mexico and around the world, which in turn offers guests the opportunity to participate in an event that stimulates all your senses." Building on the success of the first two editions, the Punta Mita Gourmet & Golf Classic is quickly becoming an iconic tradition in the world of gastronomy and golf. The event will feature gourmet meals and cooking courses taught by distinguished chefs, a series of wine and tequila tastings, festive gatherings at the luxurious St. Regis Punta Mita Resort and Four Seasons Resort Punta Mita, sailing adventures during sunset and “The Punta Mita Cup,” a two-day golf tournament with exciting prizes for the winners on Jack Nicklaus’ two signature courses Punta Mita Bahia and Pacifico. Acclaimed Mexican golfer Lorena Ochoa Reyes will be participating in the weekend’s events. Led by the executive chefs of both hotels Sylvain Desbois, executive chef of The St. Regis Punta Mita Resort and its AAA Five Diamond Carolina restaurant and Philippe Piel, executive chef of Four Seasons Resort Punta Mita’s four restaurants and a team of guest chefs from around the globe, the menu is certain to enchant attendees while famed sommeliers, tequila masters and winemakers will excite their palate with some of the regions and world’s finest wines and tequila. Notable industry leaders have already confirmed their participation, guest chefs include: Lula Martin del Campo, who is currently the executive chef of HSBC Mexico; the famed Argentine Chef Fernando Trocca; Chef Enrique Olvera of Pujol in Mexico City; the famous chocolatier and owner of Garrison Confections, Andrew Shotts; Tsuyoshi Murakami, chef and co-owner of the restaurant Kinoshita in Sao Paulo, Brazil; acclaimed celebrity Chef and Restaurateur Richard Sandoval, Chef Kaz Okochi of KAZ Sushi Bistro in downtown Washington, D.C. Thierry Blouet, chef and owner of Café des Artistes in Puerto Vallarta, Mexico; Juan Manuel Guizzo of Fasano in Punta del Este; Chef Luis Acuña of renown barbeque restaurant "Pobre Luis" in Buenos Aires; Alejandro Ruiz, director, chef and founder of Casa Oaxaca the most important exhibition of Oaxaca cuisine; Australian chef Andrew Ormsby; Chef Michel del Burgo, with three Michelin stars and leading restaurants L'Atelier de Joël Robuchon in Hong Kong and his own restaurant in Gordes, South of France; and Chef Andrew Kirschner chef and restaurant owner of Tar & Roses in Santa Monica, California. Also, Chef Drew Deckman, of Deckman’s at San Jose del Cabo; Abraham Salum, chef and restaurant owner of Salum in Dallas, Texas; Maycoll Calderon of the new J&G Grill Mexico culinary experience; the famous chef Jean Georges; remarkable sommelier and wine expert, Daniel Ovadia from Paxia in Mexico City. 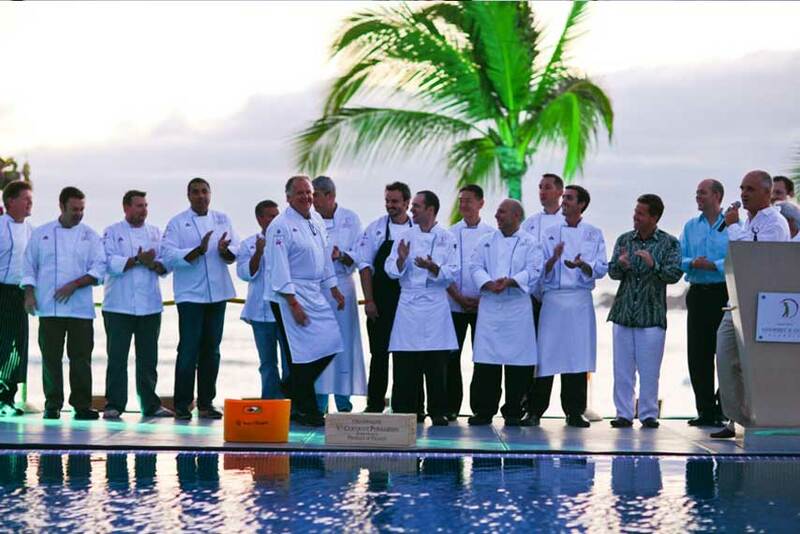 The participants' chefs at Four Seasons Resort Punta Mita include: Chef Claudia Fossa of Aramara restaurant; Chef Ramon Bramasco of Ketsi restaurant; and Chef Jose Salas of Bahia by Richard Sandoval Latin coastal grill. Furthermore, we will have the presence of Charlie Arturaola, renowned Sommelier and Wine Educator; Jesus Briseño, brewmaster and general director of Mexican brewery Minerva; and Laura Catena, president of Bodega Catena Zapata and daughter of Argentina’s most celebrated winemaker, Nicolas Catena. The Punta Mita Gourmet & Golf Classic package includes three nights stay in a deluxe room with breakfast, lunch and dinner prepared by guest chefs participating in the event, wine and tequila tastings, a farewell brunch, participation in "The Punta Mita Cup" golf tournament played in the prestigious golf Jack Nicklaus or two 60-minute massages (per person per stay) for non-golfers and airport transportation to and from the hotel. Representing a savings of 10 percent, early bird special rates begin at $1,390 USD per person for a three night stay based on double occupancy for stays booked by February 28, 2013. To book a stay at Four Seasons Resort Punta Mita, call 866-280-9490 or email reservations.pun@fourseasons.com or go online at http://www.fourseasons.com/puntamita/offers/gourmet _and_ golf/. Open since 1999, Four Seasons Resort Punta Mita is found within the gated community of Punta Mita in the Riviera Nayarit, located along Mexico’s Pacific coast just north of Puerto Vallarta. Consisting of 141 guest rooms and 32 suites, the resorts’ architectural style of quaint Mexican-style casitas blends harmoniously into the surrounding natural environment. Amenities include three pools, two golf courses with 18 holes, a full-service spa, three renowned restaurants, a private yacht, tennis courts, a kids club open all year and an extensive program of Cultural concierge; offering a vacation experience of unlimited variety plus the highly personalized service that Four Seasons guests expect and value around the world. Recent awards and honors include “Best of the Best Family Program” by Virtuoso luxury travel network (August 2012), as well as the “2nd Best Resort in Mexico” by Travel + Leisure’s “Best in the World” Awards (October 2012) and recognized as one of the “World’s Best Places to Stay” in the Condé Nast Traveler Gold List (January 2013). For more information on Four Seasons Resort Punta Mita, visit: http://press.fourseasons.com/puntamita. Four Seasons is dedicated to perfecting the travel experience through continual innovation and the highest standards of hospitality. From elegant surroundings of the finest quality, to caring, highly personalized 24- hour service, Four Seasons embodies a true home away from home for those who know and appreciate the best. The deeply instilled Four Seasons culture is personified in its employees – people who share a single focus and are inspired to offer great service. Founded in 1960, Four Seasons has followed a targeted course of expansion, opening hotels and residences in major city centres and desirable resort destinations around the world. Currently with 90 properties in 36 countries, and more than 50 projects under development, Four Seasons continues to lead the hospitality industry with innovative enhancements, making business travel easier and leisure travel more rewarding. For more information on Four Seasons, visit http://press.fourseasons.com. Combining classic sophistication with a modern sensibility, St. Regis is committed to delivering exceptional experiences at over 30 luxury hotels and resorts in the best addresses around the world. Since the opening of the first St. Regis Hotel in New York City over a century ago by John Jacob Astor IV, the brand has remained committed to an uncompromising level of bespoke and anticipatory service for all of its guests, delivered flawlessly by signature St. Regis Butler Service. From Bal Harbour to Bangkok, Saadiyat Island to Shenzhen, the St. Regis brand caters to a new generation of luxury travelers and continues to thoughtfully build its portfolio in today’s the most sought after destinations at the heart of the today’s new Grand tour. Plans for the brand to expand its legacy include much-anticipated St. Regis hotels and resorts in the Riviera Maya and in Asia, where St. Regis has announced plans to open hotels in Changsha, Chengdu, Kuala Lumpur, Lijiang, Nanjing, New Delhi and Zhuhai. Additionally in Europe, Africa and the Middle East, St. Regis will continue to expand in Abu Dhabi, Amman, Cairo, Dubai and Mauritius. For more information on St. Regis Hotels & Resorts, please visit www.stregis.com, to explore our recent debuts visit www.stregis.com/newgrandtour and for the privilege of residential ownership, please visit www.stregis.com/residences. Excellent wording used for your blog on the internet. I impress from your blog very much and like your blog on the internet. To thank you.